We are in the last week of April and I have been thinking about the season so far and any lessons I need to learn. 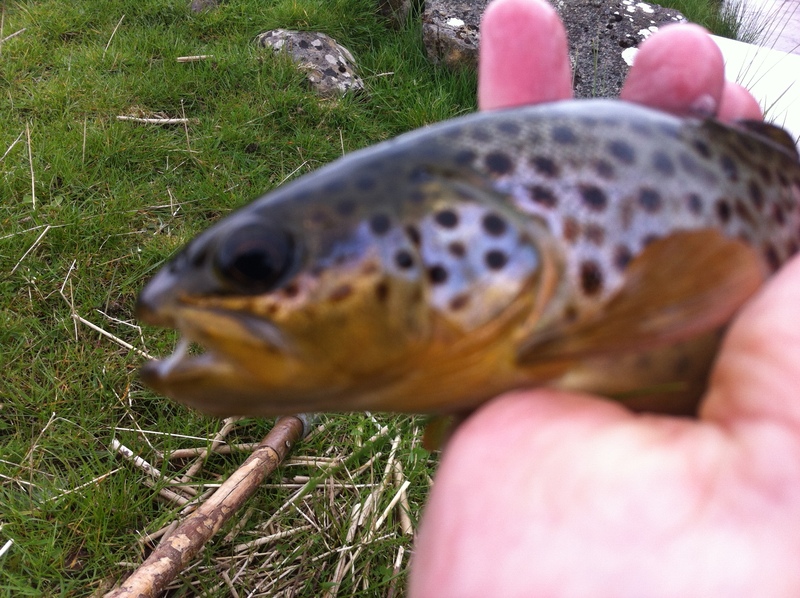 By now I would normally have landed my first salmon of the year and brought some decent brown trout to hand. Neither of these things have come to pass and the 2015 spring fishing has been very poor for me. I don’t think that I am alone and from the reports I hear other anglers are experiencing a similarly difficult time. So what has gone wrong? To my mind there is more than one cause for the poor fishing. The weather has certainly played a part. We have had very low temperatures followed by a period of unusually fine, bright conditions then a return on Saturday to a bitingly cold northerly wind. Our prefered conditions of a steady south/south-westerly air flow bringing cloudy, mild and wet weather have been conspicuous by their absence. 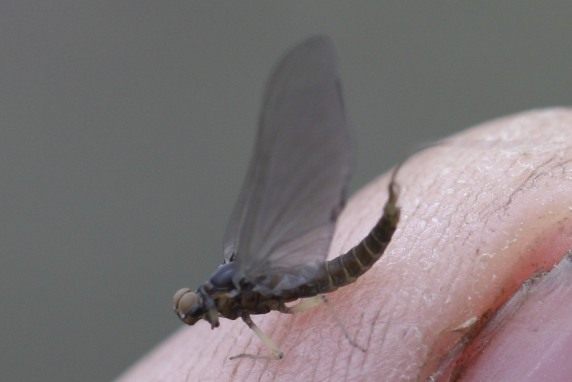 Normally good levels of fly life which are a feature of April have failed to materialise so far and we can only hope that this is a delay in the hatches rather than the loss of them in total. A few hardy olives and Iron Blues have hatched out and the small stoneflies have shown up as normal but I have yet to witness any significant numbers of flies on the surface so far. With not much to eat on the surface the brownies are hugging the bottom for now. Water levels were high during the month of March, something which usually provided good fishing. 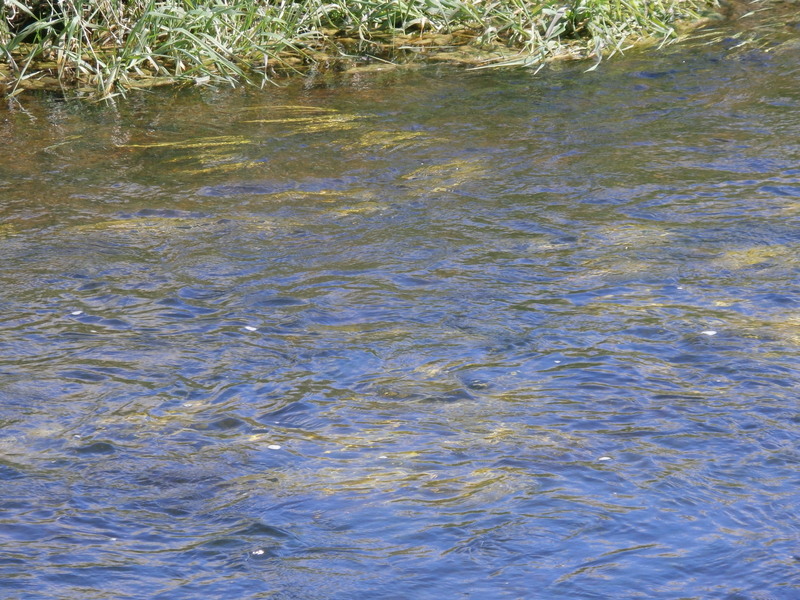 I like to think that the higher flows push food out into the open where the trout can prey on them. But March failed to meet expectations and April has been no better. With the water level on the Robe now down to summer heights the advantages of high flow have gone. Yesterday I fished two stretches of the river, both of which should be in good fettle at the end of April. I gave up on the first stretch after only a 20 minute session. The runs I fished 2 weeks ago were now ankle-deep and weeding up fast. One half pounder fell to a PT but it was clear more rain was needed urgently for this part of the river. I decamped for a deeper section some miles downstream. A change of flies and a reduction in leader thickness, based on the low clear water, and I was soon up and running again. 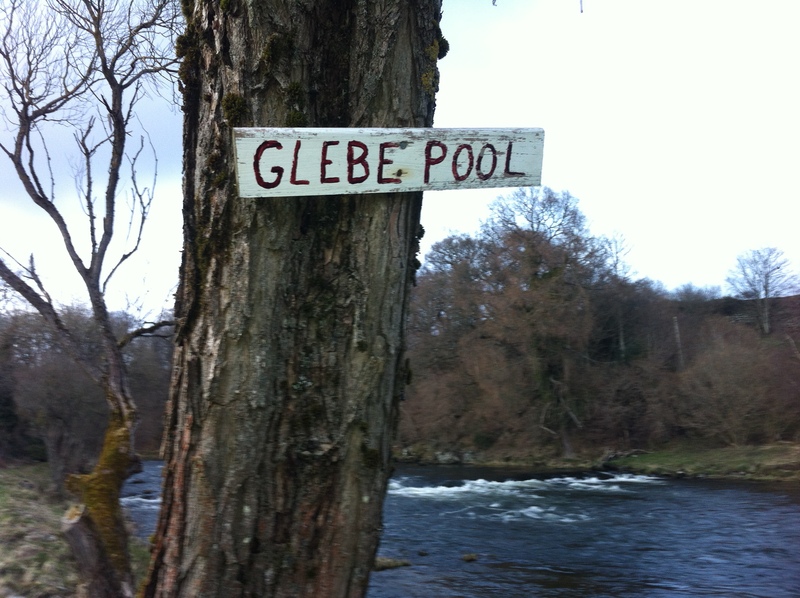 The air was full of midges but the water was apparently devoid of ephemerides. A lot of wading and tramping and casting followed without any response. This has been the theme for the season, very little signs of life in the river. I genuinely don’t get too upset when I am not catching but a lifeless river is difficult to stomach. The bitterly cold Nor-Easter could be partially to blame but I believe it goes much deeper than that. I suspect that the numbers of trout in the river at much lower than normal. Pollution, poaching or natural selection are all possible reasons for the drop in the trout population. The river has an eerie quietness about it, bird life seems to be quiet and I have seen none of the animal tracks in the margins that I would expect. In total I brought about a dozen trout to hand, but most of them were in the small to tiddler range. I managed one good fish of around the pound from a very skinny piece of water at the tail of a gravelly pool. I swear there was no more that 3 inches of water covering him when he took my Francolin Spider. 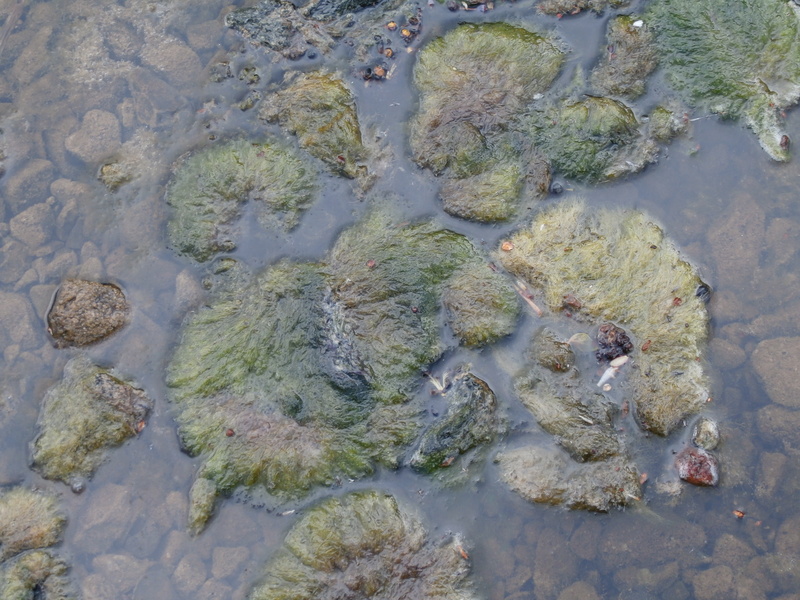 The hot weather sandwiched in between the periods of cold gave has given the algae a head start this year and margins of pools are bedecked in rafts of green slime. Chunks of it break off and can be seen floating down the river and hooked fish usually manager to cover themselves and the flies in a coating of the stuff when fighting. In itself I am not aware that the algae is harmful but it is an indication of the nutrient levels in the system. So what will the rest of the season bring on the rivers? If I am right and stocks of trout are well below normal then there will obviously not be much of an improvement in the fishing this year. The rivers around here are all natural and there is no stocking carried out, so nature will have to come to the rescue if possible but that will take time. 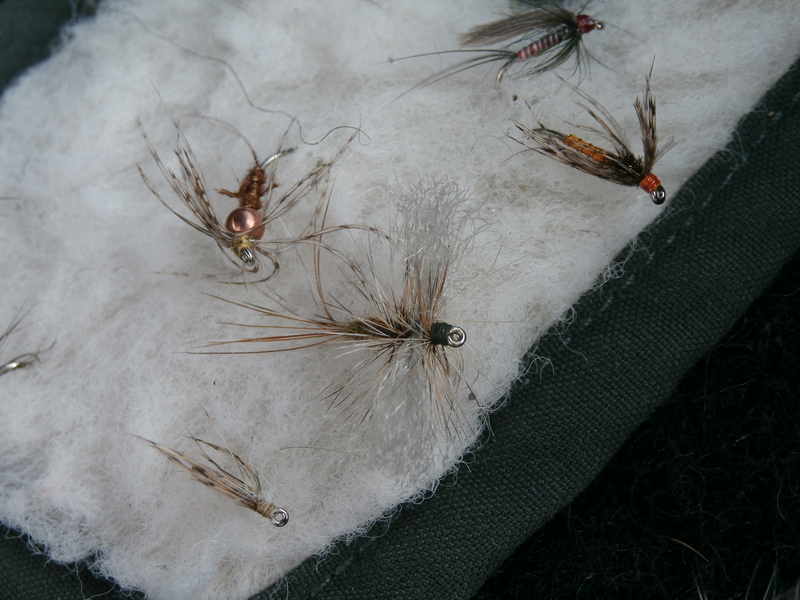 With (hopefully) milder weather in May and June the evening fishing should start and I am planning on fishing the sedge hatches through the summer in the hope that some of the better fish which have been hiding in the deepest pools will move out and feed under the cover of darkness. My salmon fishing so far has been both low level and unsuccessful. Very few salmon have been caught in the area this spring with poor angling conditions again largely being blamed. 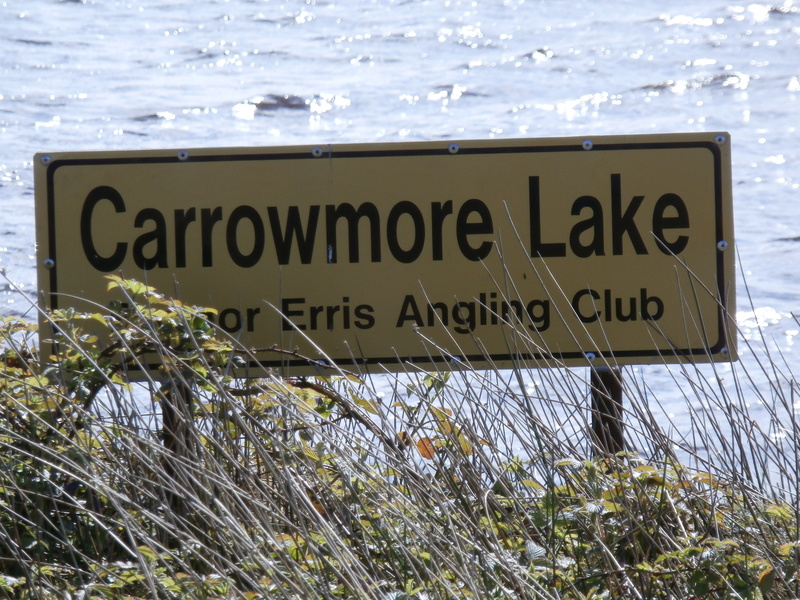 I fished Carrowmore Lake on saturday but we came back to the shore with clean boards. 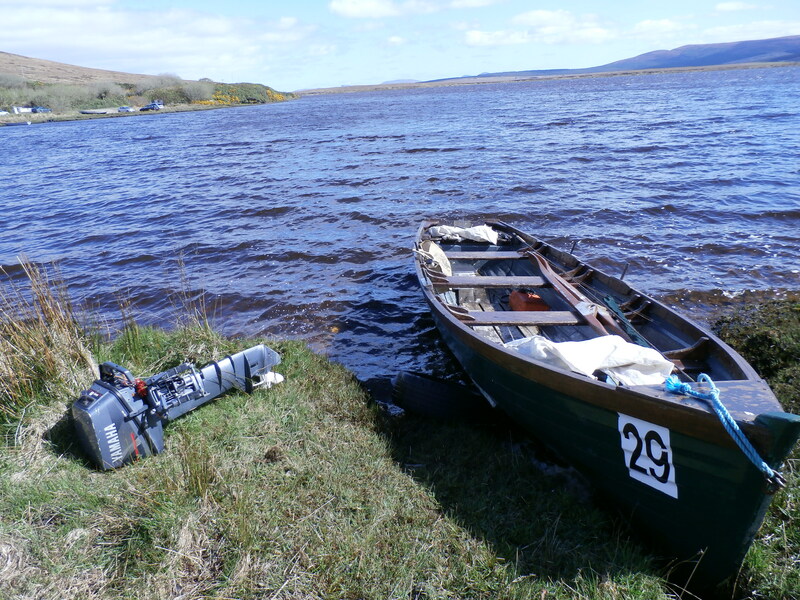 Seamus reported 4 fish boated on that day but there were 17 boats out in reasonably good conditions so the lake is still not fishing very well. I am reading reports from Scotland and the lack of fish over there seems to echo our woes on this side of the Irish Sea. All over it looks like a dramatic collapse in salmon stocks, the kind of doomsday scenario which environmentalists have been warning us about for years. 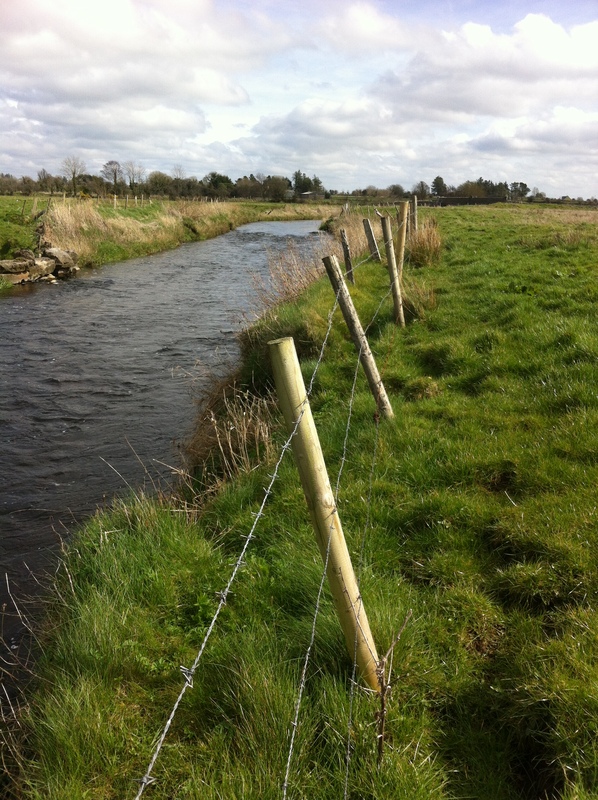 In Ireland the spring salmon were decimated years ago by the government sponsored environmental vandalism of drainage works on just about every river in the country, so we have been struggling to catch many early fish for a long, long time. How will this year pan out? I expect a few more springers to turn up with the next spate and the grilse will show up beginning in May and gradually building in numbers if we have a wet summer. 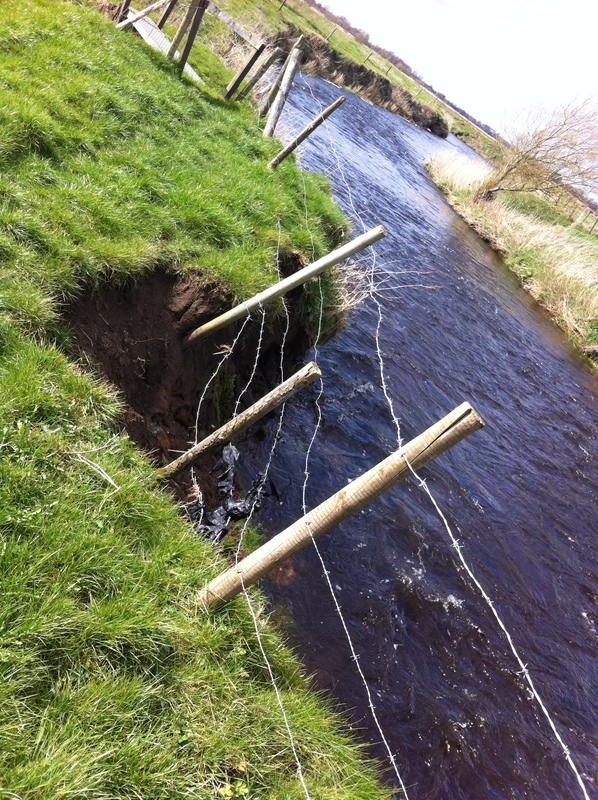 A dry summer will spell an angling disaster for us though. I don’t have any answers to our lack of fish, the problems are complex and we humans seem to be adding more every year. Fish farming is a horrible business and it has added to the loss of wild fish here. More farms are at planning stage and if they are successful (which I have no doubt they will be) it could be the final nail in the salmon’s coffin. I plan to try hard to catch a few this year – there may be none to catch in 2016. After another fruitless day trolling for salmon yesterday I was ready for some fly fishing today. I felt like a change of venue so I turned to technology and consulted Google maps. At the highest resolution you can discern water features such as bends, weirs and rapids and I use this to guide me to new spots on the local rivers. 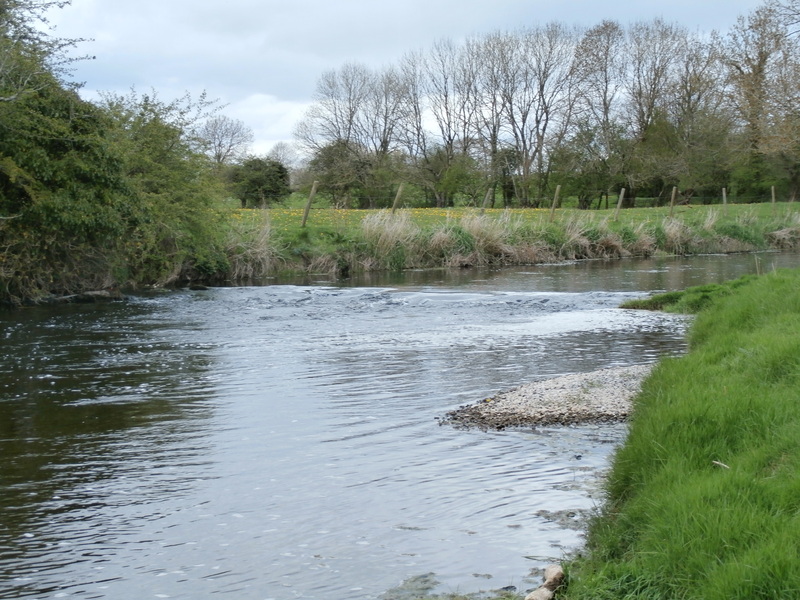 I spent some time this morning going over parts of the River Robe which I had not fished before looking for just these kind of features and I liked the look of a short stretch near Crossboyne. 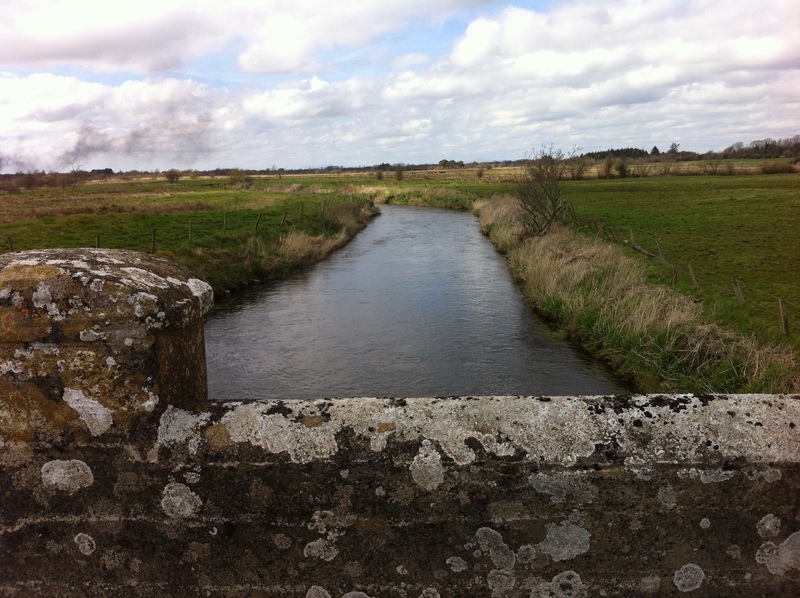 I’ve fished upstream of Crossboyne many times but between there and Robeen was virgin water to me. I knew a lot of this part of the river is deep, slow and canal-like, very poor water for trouting. 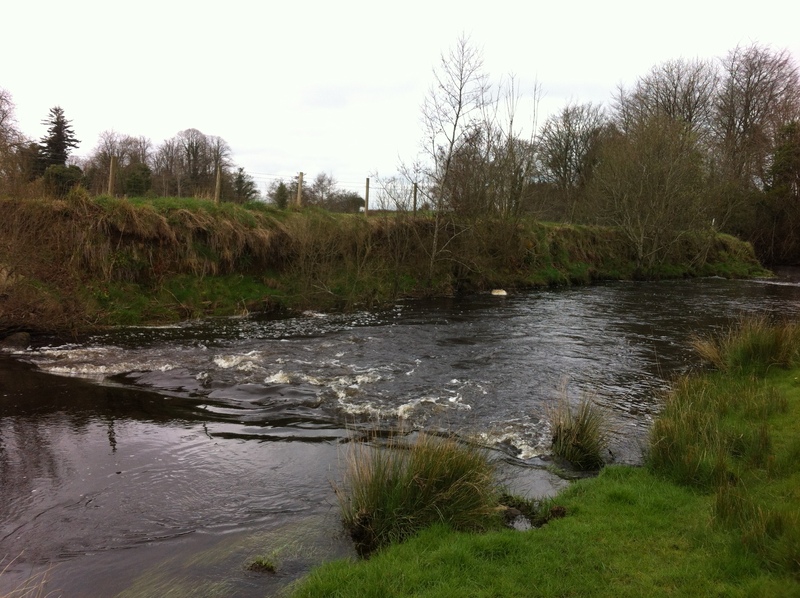 But the maps seemed to show some weirs and bends around Curraghadooey. I planned to give them a try after a quick look further upstream at Castlemagarret. I know the Castlemagarret stretch in great detail and started at the first good pool. Water level was good and the river was obviously slowly dropping after the recent rains. I set up with a team of 3 wets to search the water. 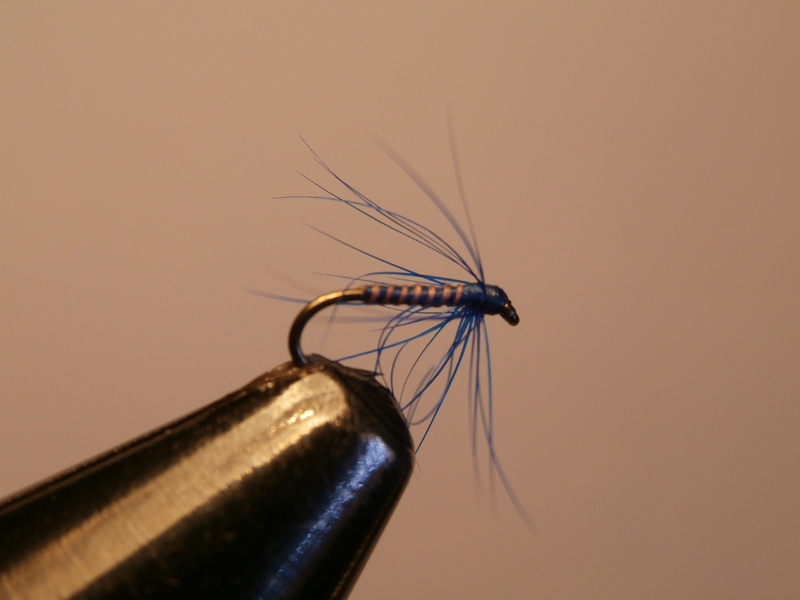 An experimental size 18 Iron Blue Dun pattern went on the bob, one of my own ‘Benjamin’ spiders occupied the middle position and a Beaded Endrick Spider was the point fly. After a handful of casts an 8 incher grabbed the Iron Blue, a good start! I fished a couple of pools and runs without any further offers so I legged it to a long pool further up river, bypassing less likely water. 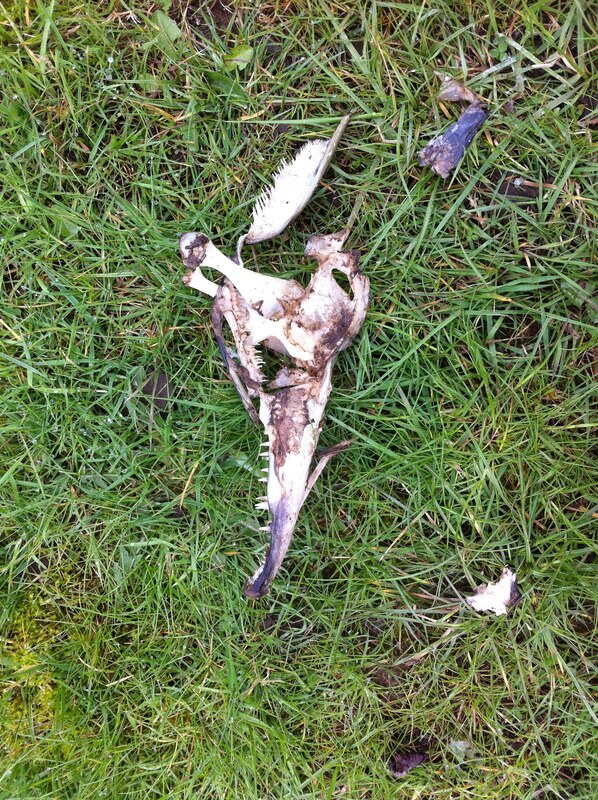 The remains of a Pike were lying in the grass at the high water line. The Robe has a big population of these and I keep meaning to fish for them during the winter but somehow never quite get around to it. I slowly fished downstream, flicking the flies into the little bays and around any rocks in the river. I missed 3 fish before finally landing another smallish lad, this time on the Endrick Spider. With no fly life and certainly no fish rising this was looking like it was a day for wet flies so I plugged away with the team of three, ending up with a tally of 7 trout only two of which would have been worth keeping. By now it was well after 1pm and I walked back to the car and set off to execute the second phase of my plan for today. 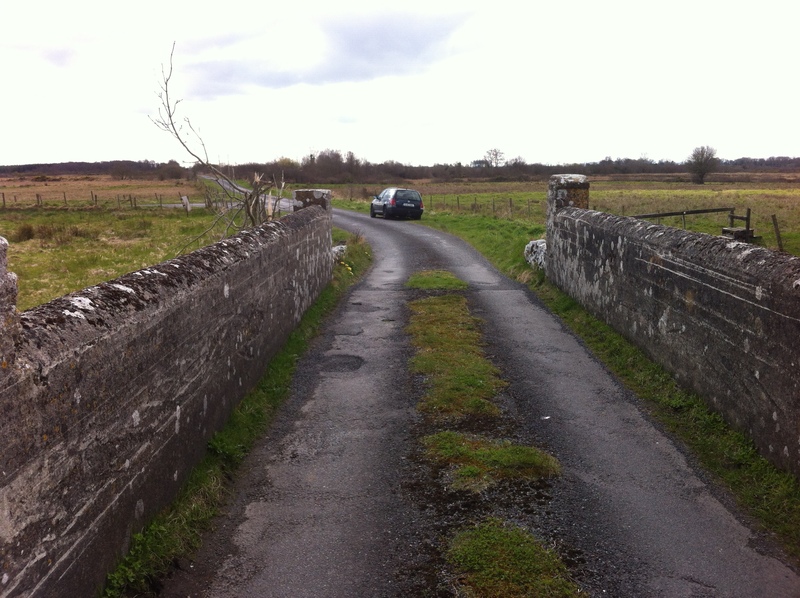 Some dodgy map reading notwithstanding, I eventually discovered the tiny concrete bridge over the river I had identified on the computer and parked up nearby. I had planned on fishing my way upstream from the bridge as I had seen a weir and some fast water on the map up there, but when I looked over the bridge it was clear there was some good water immediately below the bridge. The only problem was going to be how to get to the water’s edge. The farmer had his fence as close to the river as possible and the bank was pretty much vertical and around 10 feet high. I decided to try fishing from inside the field, casting over the barbed wire fence and accompanying each cast with a prayer I wouldn’t hook anything too big. The water looked perfect with excellent flow and depth. Only a few casts in and the first trout snatched at the flies. I got him on the next cast, a shade under a pound in weight and a nightmare to swing up to my hand through 3 yards of thin air. He had fallen for the Benjamin. Within a few minutes I was in action again when first one and then a second fish took the flies but they both fell off during the fight (the Lord be praised). 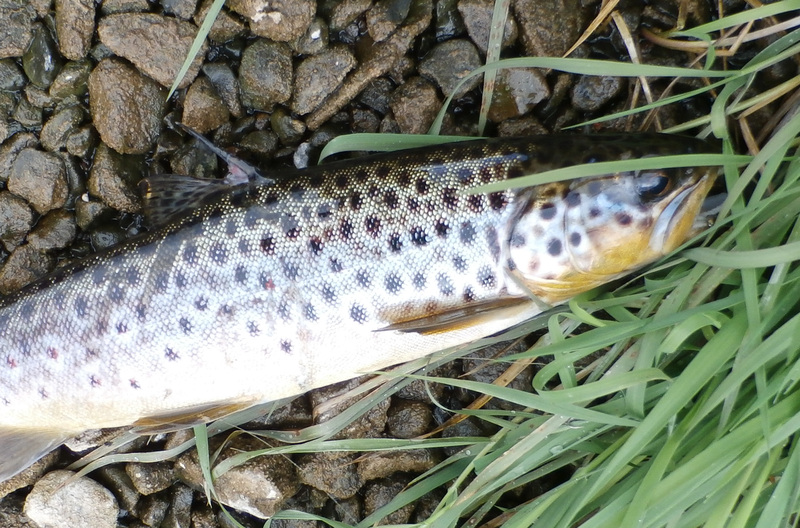 The fishing was hectic for the next half-an-hour with trout coming steadily to all three flies. Access became worse as the bankside vegetation increased. I managed to slither under the barbed wire to get closer to the water which helped slightly but the going was tough and I nearly took a ducking when a fencepost I was using for support came away in my hand. Some Sandmartins appeared, the first of this seasons swallows and the fields were home to a number of very vocal larks. Time spent on the river always passes quickly and today was no exception. Sport slowed and finally died away just after 3pm so I trudged back to the car which had by now settled into the soft verge and was sitting at a somewhat alarming angle. Loaded up, I was able to extract it from the muck without too much drama but I will need to find another spot to park when I go back to this stretch again. 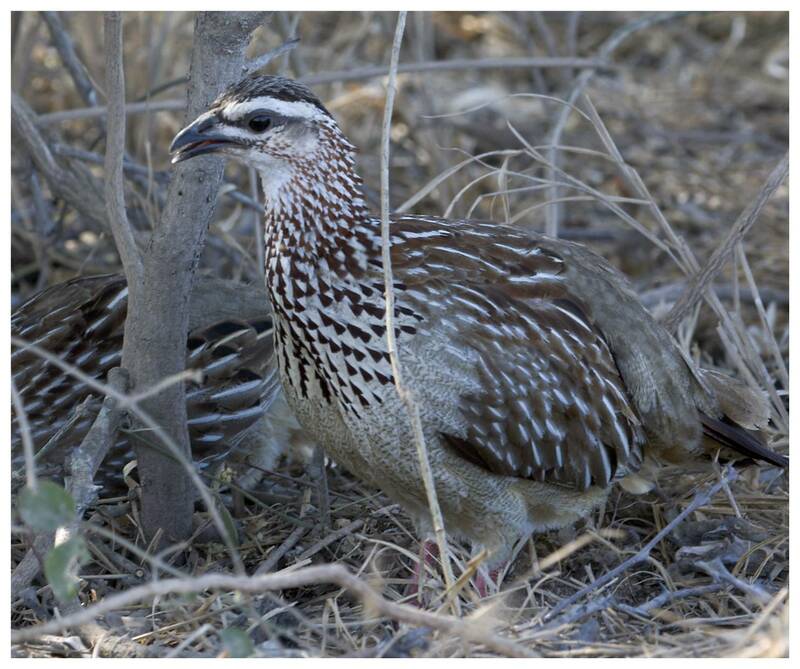 Hackle: the small body feather of an African Francolin. These are pale tan with lovely dark barring. I also tie a dark version of the Benjamin with claret tying silk and use both versions when small stoneflies are on the water. I will definitely be back to give this stretch another try soon. There is some excellent water and it fished very well despite the lack of a hatch today. And I have yet to venture upstream as was my original plan. My final count of trout for the day was 16 with 4 or 5 of them being in the 14 to 16 ounce class. All the flies I tied on produced fish, so they were not too fussy (for a change). I had better make up a few more Benjamins this evening and I have an idea that a Hare’s Ear variant might be worth a try!